John Sisson Contracting was founded in April 2002 by John Sisson. The company is based at Penton in Carlisle, Cumbria. We build on our good relationships with our customers, many of whom are repeat buyers of our steel-framed buildings. John Sisson Contracting is committed to environmentally responsible methods to secure a more sustainable future. The name of John Sisson Contracting has been synonymous with the design and construction of quality steel framed buildings for over 16 years. We provide a comprehensive steel building fabrication service from concept to completion, thus relieving our clients of the responsibility of coordinating the various trades associated with building and refurbishment projects and the day to day running of the contract. This one-point-of-contact approach enables us to develop a close working relationship with our clients to establish a trust where quality and value are paramount. We retain a skilled and balanced labour force, backed by an experienced contracts team and, where necessary, by a team of highly specialised sub-contractors, enables John Sisson Contracting to handle steel building contracts of varying size and complexity. Full technical support is provided and regular site visits ensure the quality and smooth running of the contracts. All our buildings are designed and detailed using the latest computer software with AutoCAD. Our in-house team have many years of experience in concluding design details, contributing to the overall goal of design completion prior to construction. Our range of detailing works covers the whole of the construction sector. Whether it is a small handrail to a full design and build construction package we can accommodate all works as requested by our clients. Full modelling provides clients with visual design and detailing information that often aids related trade design for clash control and secondary steelwork design scope. Output in BIM format gives fully addressable models for beneficial use beyond the construction phase for Facilities Management. Our metal cladding details are also done with precision. General arrangement drawings, interface details and individual flashing drawings are produced for all of our projects. This also allows us to have full traceability for everything we supply to our clients. 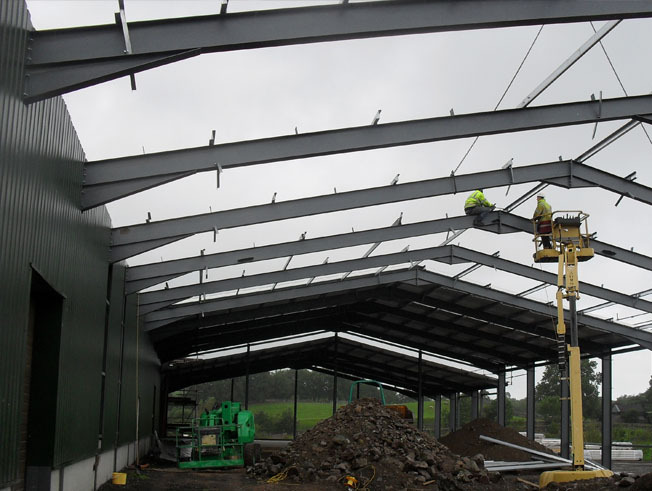 John Sisson Contracting in Cumbria, specialises in the fabrication of all types of steel framed buildings including clear span steel portal framed buildings. We do not supply steel buildings manufactured by other companies. We fabricate all structural steelwork at our fabrication facility near Carlisle in Cumbria. John Sisson Contracting construction department will erect your steel building complete with groundworks and foundations if required. We make strong, durable steel-framed buildings and structural steelwork for any purpose. From agricultural farm sheds to industrial units,we can pre-fabricate buildings in our (9,000sq ft) factory near Carlisle Cumbria. Our in-house structural, technical and drawing department will design your buildings to fit your exact needs, handle planning applications, produce structural calculations for building control authorities, and create elevation and manufacturing drawings. Quality is key in every little aspect of the steel building construction. The mindset of both our senior employees and all the way to our on-site contractors and construction workers centers on attention to quality. It's our attention to details that allows us to work on a multitude of projects simultaneously, while staying on schedule! John Sisson Contracting construction department will erect your building complete with groundworks and foundations if required. The Industrial and Agricultural steel portal frame structural steelwork is detailed and manufactured at our workshop near Carlisle. All steel buildings are supplied complete with any type of roofing or cladding material. These can be single skin plastic or polyester coated steel sheets, profile 6 fibre cement sheets or composite panel sheets. Insulation can be double skin sandwich construction or insulation combined with the outer sheet as in a composite panel. Walls can be brick, block, shuttered or pre-cast concrete panels. Doors can be supplied as firedoors, roller shutters, personnel doors, sliding doors or any other type of door.